...14 days after pick-up, your check shows up in your email! Consignors who help with the event earn 70%. HELP @ the SALE! If you consign more than 300 items and plan to pick up your unsold items, you must volunteer for one of the breakdown shifts. Our tagging site NEVER closes and you can even tag from your phone! There is NO limit to the number of items you can sell! Recommended minimum of 20 items. No more meeting people in parking lots or hosting a garage sale. Watch your sales live during the event! You will receive your check 14 days after the close of each event. Print the GETTING STARTED GUIDE! Join other smart & savvy helpers who are selling their items and get rewarded! We LOVE our JBF Team Members! You make our events SO successful. Team Members who complete a minimum total of 4 hours earn 70% on their sold items. To sign up for one or more shifts, REGISTER as a CONSIGNOR AND TEAM MEMBER, and select the shift(s) you want to work! Reserve your spot TODAY! They fill up quickly! Complete your consignor waiver HERE. Please have your clothes on hangers, sorted by gender & size, before you arrive. When you get to JCCNV, look for the JBF Drop Off Signs at the Gym doors. You can park outside of the entrance to unload, then go park your car. 1. Unload your items and bring them into the gym. Once inside we have rolling racks available on a first come, first serve basis that you can transfer your items onto for putting out on the sales floor. We recommend having your items sorted when bringing them to make your drop off process smoother & quicker. Clothes together in size and gender. Similar toys together, etc. 2. Move & park your car in the main lot. 3. Once back inside, check in, get your checked in sticker, then go to an inspection station. 4. While your clothes/shoes are being inspected, take your items to the sales floor drop zones or recall station. 5. Once all of your items are put out on the floor, head to CONSIGNOR CHECK OUT. 6. Watch your sales grow with our real-time updates. REMEMBER to bring your ID to claim your Items. We will not allow any early pick-ups. If you have any unsold items you will need to attend PICK UP to claim them. Items will be sorted by Consignor # for your convenience. At 8:30p, ALL remaining items will be donated to our charity partner. Sorry, NO EXCEPTIONS. ~ Only EXCEPTION: We WILL ACCEPT all season of clothing ONLY for sizes 0-12 months at each event. We accept boys and girls clothes, newborn to size 14/16 (juniors) and maternity. We will have smaller areas for onesies (0-24 mos), pajamas (0-24 mos), socks, hats, scarves, tights, and other accessories that do not need to be hung. These items need to be in a clear zip-lock bag (you may group multiple items in one bag). Tape the tag to the bag (inside or out) and tape bag CLOSED. All clothes must be on a hanger with the hanger making a "question mark". Infant through size 5T should be on child sized hangers. Larger sizes should be placed on adult hangers. Tags should be safety pinned to the left front pocket area of the item (or the right as you are looking at the item). You may also use a tagging gun - the tag must be attached through the existing tag of the clothing and hanging outside of the piece. PLEASE be careful with tagging guns - if not used properly, they can easily ruin clothing. We cannot accept clothing that has any stains, rips, tears, missing buttons, or noticeable wear. We also cannot accept clothing that is significantly dated. For outfits with multiple items, or items that you are pairing together, safety pin the items to each other and then to the hanger. TIP: Recommended minimum clothing price of $3. If something should be priced less than $3, it is a good idea to group the item together with another one or two items to create a lot that can be priced higher. We have an easy to use, state of the art bar-code system that is easy for you and shoppers alike. The online bar-coding system allows you to set up your tags with great descriptions to help your items sell. You also can easily track your sales online each evening from home. You must tag all items using our online tagging system. You set your own price on all items. Click here to download our Pricing Guide. Wondering what to sell? Check out our What To Sell Doc! Click here for a helpful video! Fasten tags securely to your items with clear packing tape; do not use scotch tape. You can also punch a hole in the top of your JBF tag and attach the tag securely with ribbon or string. Zip ties are great and useful for attaching tags and multiple items together (these can be purchased at a local hardware store, discount stores, dollar stores or wholesale stores). Check items for recalls. You can go to the CPSC website or use the safety & recalls button at the bottom of this page. If the item has been recalled but there is a fix for the item, please contact the manufacturer for the fix and then it can be sold at the sale. When you drop these items off at the sale, please be sure to check in with our recall specialist to have them do a double check on the item as well before you leave. Any baby equipment item that is too large to carry on it's own for a shopper will receive a claim ticket at drop off. Baby Equipment with a foam padding/filling will need to be sanitized on the sales floor at drop off. When attaching tags to furniture items we recommend either using a ziptie to attach the tag securely, putting a piece of tape over the top of the tag before hole punching and putting the zip tie through. You can also use blue painters tape for furniture items. Especially for wooden furniture so you do not damage the finish when attaching the tag. For items with multiples pieces, (for example: a travel system that includes a stroller, car seat & base) put a tag on each piece. Create the first tag with all of the necessary information as normal but include "1 of X" (X is the number of pieces). Only use multiple tags for items that belong together. Package: Put bedding/crib/bedroom sets together in original packaging or in giant clear plastic bags. Arrange bedding sets inside bag so that shoppers can see all of the items as well as the design/pattern. A picture on the outside of the bag helps the items sell better. Secure the bag so that items do not get separated. Bundle blankets, cloths, and towels like a package with ribbon, string, or large clear bag (be sure multiple pieces cannot be separated). Blankets, cart covers, etc. sell better when hung over a hanger and pinned so they don’t fall off. All used bedding will be treated at the sale with a germicidal spray as required by the State of Virginia Department of Health. We recommend NOT sealing your bedding bag with tape since it will have to be opened for this treatment. Sanitization will take place during and right after Drop-Off, so that they can be properly sanitized. As required by the VA Bedding & Upholstery Law, applicable items will be treated with the spray, logged and tagged. We do not guarantee that multiple pieces in a bag will be placed back in the bag exactly as they were before they were sprayed, however we will do our best to place the items in so that they can been seen by shoppers. Ride-on toys, block sets, dolls, remote control cars, outdoor toys, learning toys, and more. 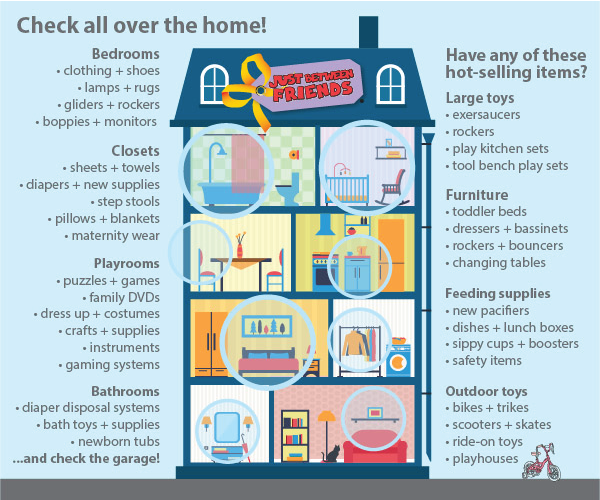 All toys must be checked for safety recalls before consigning. Clean all toys and baby equipment thoroughly. **Please test to make sure that toys and equipment are working properly. Battery operated toys must include working batteries (these can be purchased inexpensively at local discount stores). TIP If you are Missing pieces, call the manufactuer to see if you can order a replacement part. Tag: Attach JBF tag directly to item with clear packaging tape (do not tape over the barcode) or hole-punch JBF tag and tie it to item. BOOKS: Please use caution when attaching tags to books. Do not use packing tape. We recommend using BLUE PAINTERS TAPE. This adheres nicely to the book but peels right off without causing damage to the book. Bundle several books together using a ziploc bag and attach the tag to the outside of the bag. Seal the top of the bag with packing tape. If you think a book cannot sell for our recommended $3 price minimum, bundling several together is a great way to sell them! Please use caution when attaching tags to puzzles. If you are concerned packing tape may damage the puzzle, use BLUE PAINTERS TAPE. Also, to secure pieces to infant/toddler puzzles like Melissa & Doug makes, we recommend using plastic wrap. Wrap it around the puzzle completely then secure with packing tape. The ensures shoppers can see what the puzzle looks like and it doesn't get damaged by tape, etc. DO NOT use packing tape to tape pieces down to the puzzle. This will damage the puzzle and make it unsellable. When tagging DVDs, please be sure to test them first and make sure they work. Secure the DVD inside it's case by putting packing clear tape over the side so it cannot be opened and the DVD removed. Attach the tag to the back of the DVD case. If you are concerned that attaching the tag with packing tape could damage the case, use blue painters tape. If selling multiple DVDS as a set, secure them together inside a ziploc bag. Put clear packing tape across the top to seal the bag. Attach the tag to the ziploc bag. When tagging Video Games, please be sure to test them first and make sure they work. Do not seal the case with the game inside. We remove the game from the case at the sale to keep it secure. When you drop off, please give your video games to a team member at consignor check out. They will hold onto the games and prepare the cases to go out on the floor minus the game to keep the game secure throughout the sale. Attach the tag to the back of the video game case. If you are concerned that attaching the tag with packing tape could damage the case, use blue painters tape. If selling multiple video games as a set, secure them together inside a ziploc bag. Attach the tag to the ziploc bag. NO explicit PG13 or R rated DVDs/Video Games. If you have a high priced item please see a volunteer during Drop Off. Shoes: Make sure that shoes are clean, clean, clean! Magic erasers work wonders! We will be VERY selective with shoes during Consignor Drop Off & Inspection. Shoes can be any season for 0-12m and Fall /winter for 18m and up. (Fall = October thru March; Spring = April thru October). Fasten shoes together with zip ties. For infant shoes or small shoes without laces, you may put the shoes in a clear zip-lock bag. We prefer no shoe boxes, they do not sell well. Shoes must be in good condition and we recomment starting at $3.00 for infant/toddler; Add $1 each for larger size, name brand, or heavy/winter. Punch a hole in the top of your tag (reinforced with tape) and attach the tag to the shoes with the ribbon, string, or zip tie. For infant shoes in a clear zip-lock bag, put the tag inside the bag and tape the bag shut with clear packing tape. IMPORTANT: Tags must be reinforced by placing a piece of tape or hole reinforcer on the top of the tag before pinning or hole punching. Bags, Diaper Bags, Baby Carriers, Slings, Blankets, Swaddles, Nursing Covers, etc. These are all great consignment items. Please bring these items on a hanger (safety pins and zipties help hold them on). We will have a designated clothing rack to hang these on. Package: Please zip-tie items to an adult-size hanger. If you have a high value item (over $20) we will help you zip tie it to the rack for safe keeping and also attach a yellow claim ticket to it so that the item can be purchased. Price: Price 50% - 75% off retail. Items in great condition tend to sell very well. Price it for what you would pay. Tag: Hole-punch JBF tag and attach it to item with ribbon, zip tie, or string. If item contains multiple pieces, be sure all pieces are included and list number of items on JBF tag description. Video for tips on tagging multiple pieces. • Hangers - Child or Adult sized hangers, depending on the size of clothes you are preparing ~ plastic or wire hangers are acceptable. We recommend kid hangers for size 5 and under and adult hangers for sizes 6 & up. • Clear Packing Tape - Do not use scotch tape, masking tape, or duct tape. • Blue Painters Tape - This is great for attaching tags to items you don't want to damage like books, painted furniture, etc. • Scissors - A paper cutter is good to cut tags if you have one, but not necessary. • Clear Self Sealing Bags - You will use several sizes of these for many different items. • Ribbon, String, or Zip Ties - Keeps shoes and multi-pieced items together. • Tagging Gun and/or Safety Pins - Size 2 (1 1/2") or larger are the best sizes to use. • Plastic Wrap - Great for puzzles. • Cleaning Supplies - For cleaning and disinfecting items. We love Magic Erasers! • Batteries - All battery-operated toys must have working batteries installed. Please feel free to contact me! I am here to help you! Welcome to JBF Central Fairfax! As a mom myself, I appreciate the importance of a community of moms supporting moms, parents helping out parents, and friends working with friends. It is awesome to be part of this community, and thank YOU for joining in! What better way to combine a love of shopping, saving money, making money, helping others, and going green by recycling gently used items!